The weather here lately is so confusing. It's not winter, although the leaves are all on the ground. It's Christmas-time, my decor says so below, but there's not a flake of snow in the air or on the ground. It's not fall, although the days are sunny and fairly warm...it's almost spring-like, dare I say. This has led to what I'm going to coin OCCBWD - outfit confusion caused by weather disorder. 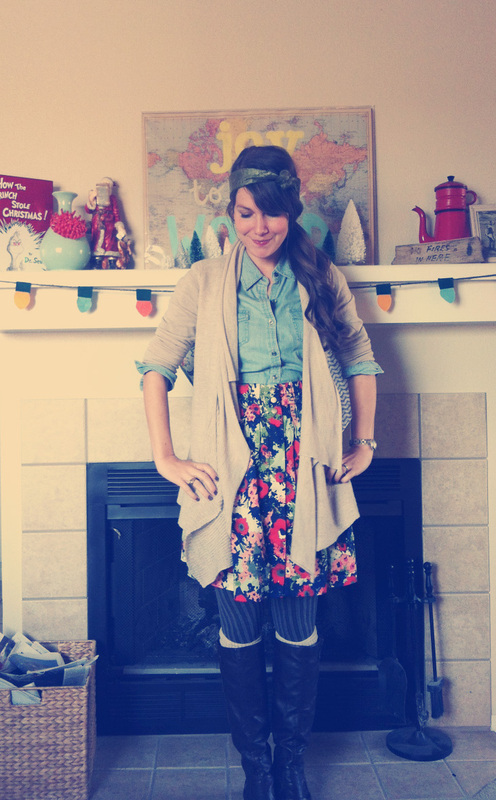 Floral skirt paired & a chambray top paired with sweater tights, socks, boots, and a sweater? Someone help. I'm so confused...but I secretly like it. Anyone else suffering from OCCBWD? ;) Or a better question: what SEASON is it?! I'm pretty sure it is spring-time here in Georgia. It is our first winter here after a move from Utah so I am still trying to figure out if it is always like this. I have to choose between a cardigan or boots because it is in the 70s here. I see people at the store with shorts on all of the time! I am loving the pattern on that dress! So pretty. We've had weird weather here in the Carolinas too. There were people in shorts over the weekend! I think you should post photos of your Christmas mantel because, from what I can see, it's ADORABLE! Whatever it's called...it works! I have bare legs today...it's going to be 70! Dare I say, BRING ON THE COLD WEATHER FOR THE LOVE?!?!?!!?!? I am so confused! I leave my house at it's 65 and breezy. By mid afternoon we've hit 80 with a humidity level that has to rival the equator and my tights and boots no longer make sense to the general public or my comfort level. Ugh! Just get cold already! Oh my I LOVE this outfit ! It's so much fun and cosy ! i just wore that skirt recently for the same reason! we reached the 60s today - so weird! i have been looking for a great chambray that won't break the bank.. looks like i'll have to check out Kohl's! 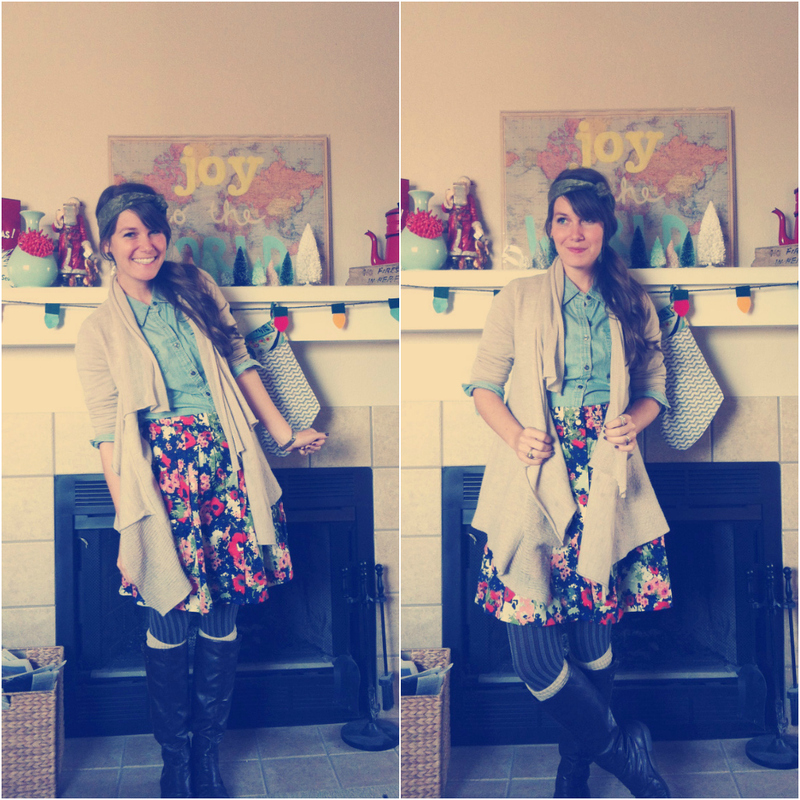 This outfit totally works on you! It can be very difficult to get dressed when the weather is playing tricks, but it looks like you've found a great solution: combine all the seasons. ;) It's fabulous! I love your outfit. So cute and fun. 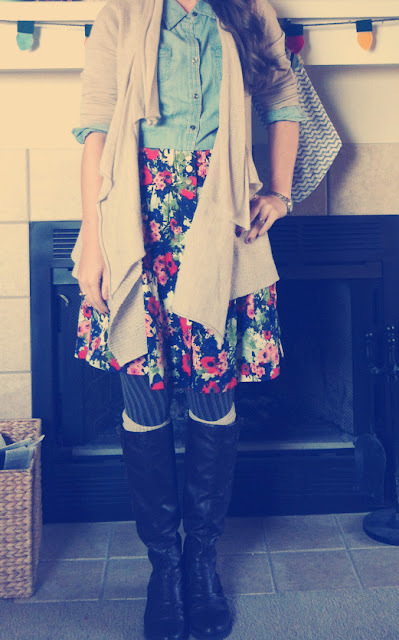 You did a great job with all the layering. Pretty sure I'm sorta nuts about this outfit! I love this look, especially your skirt! I am now following your adorable blog and can not wait to see what you post next! I totally feel ya on this one! I live in Colorado and we have been in the 60's so far this month! We won't see cold weather until January.